Get news of the latest Powerball winners, and game updates. It may be one of the toughest games in the world to win, but it’s still much loved. Read more about the US Lottery and Powerball here. A man who shared a NZ$38 million first division lottery win unexpectedly turned up for work the next day. His mates chased him off. When the man handed over his ticket to the clerk at a store, the words “Congratulations, you are a first division winner” appeared on the screen. Patience pays off, even in lottery play. This is what a group of six 50-something co-workers learned first hand. Workers at the NTN Driveshaft in Columbus have played the lottery as a syndicate since December 2016 when there was a record Powerball jackpot. Is there a person who would throw $50,000 in the trash bin? It may be unintentional but that’s what a store clerk almost did. Kevin Hayek likes buying Powerball tickets but does not bother to check them promptly. 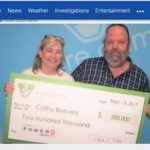 This week’s stories of lottery joy begins with a Virginia couple who thought the had won $400, only to discover the win was for $200,000. Across the pond the national lottery made retirement sweeter for a retired care worker and an Ashford couple who each won £1 million. When Kenny and Cathy Robin Beavers won what they thought was $400 playing Powerball, Kenny wanted to give the ticket to their daughter as a wedding present. It was a record breaking single person win record when Mavis Wanczyk posted a $758.7 million Powerball lottery win. But amidst the celebration, a mix-up in the announcement went unnoticed for some time. A two-man lottery playing syndicate, who call themselves the B-Squared Lottery Club has just won a million dollars. The two had been asking other co-workers if anybody was interested in pooling for the lottery. A lottery win changed Mavis Wanczyk from an ordinary hospital worker to the biggest ever winner of a lottery prize in the US. Police are so concerned they’ve increased patrols in her neighborhood. The Powerball Lottery has set a new record – and a Massachusetts hospital worker has retired from work because of it. History was made when Mavis Wanczyk won a $758.7 million Powerball Lottery jackpot.